Build your project. Engage with your community. Transform data into insights. Make better decisions. Projects can be either short-term or ongoing community engagement projects. 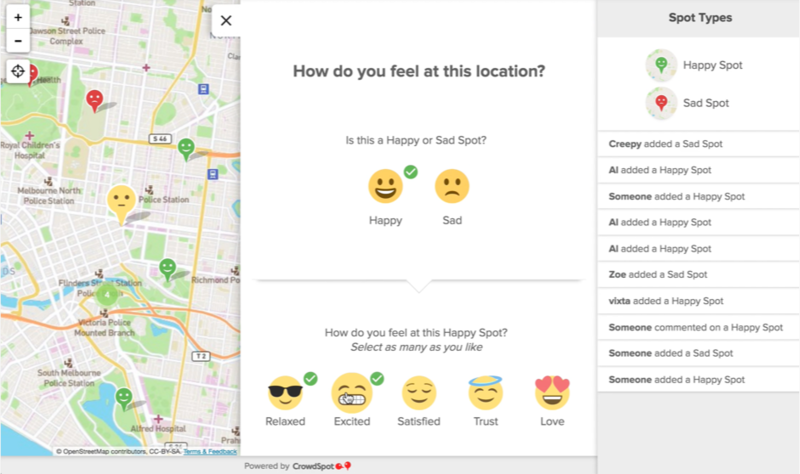 Build your project with the right map design, survey configuration and branding to match your community and the information you want to collect. The visual and social user experience helps to generate greater participation rates over the life of your project. 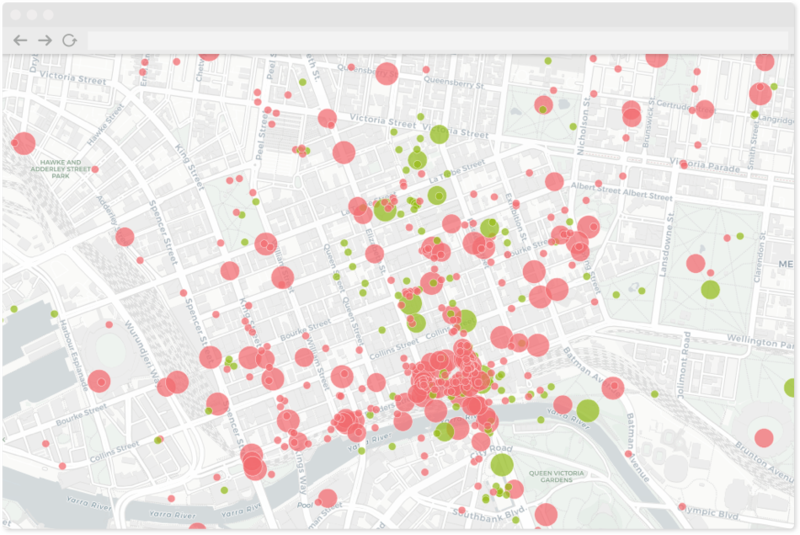 Transform your community-generated dataset into real insight. Visualise data for analysis and effective communication. CrowdSpot provided an excellent base to develop our Strategy. We generated strong interest, high participation rates and quality detailed feedback. Great value for money. Love working with CrowdSpot! They are professional, patient and delivered everything on time and under tight deadlines. I would recommend them time and time again. This is the first time council has used CrowdSpot and we found it really helpful. It’s been a great tool, enabling so many more responses. In collaboration with The Squeaky Wheel and enabled by a TAC Community Road Safety Grant, the BikeSpot project was built to explore differences in the perceived risk and real risk of riding a bicycle in Melbourne. Users were asked to identify how safe and unsafe they feel at location across Melbourne. The data collected is now being compared to VicRoads CrashStats. View the blog post. Towards the end of 2016 we worked closely with Plan International Australia on the Free To Be project. This important project focuses on making Melbourne safer for young women by first providing the opportunity for people to share their safety related experiences and emotions around Melbourne. The results are currently being shared with key decision makers. Please contact us for more information or if you would like to conduct a similar activity in your area. The Santa Clara VTA recently used CrowdSpot this year for the i-280 Highway Corridors Study. The popular highway corridor, which runs through the heart of Silicon Valley, attracted a huge amount of interest with over 2,500 submissions. The data is now being analysed to develop a new strategic plan for the area. 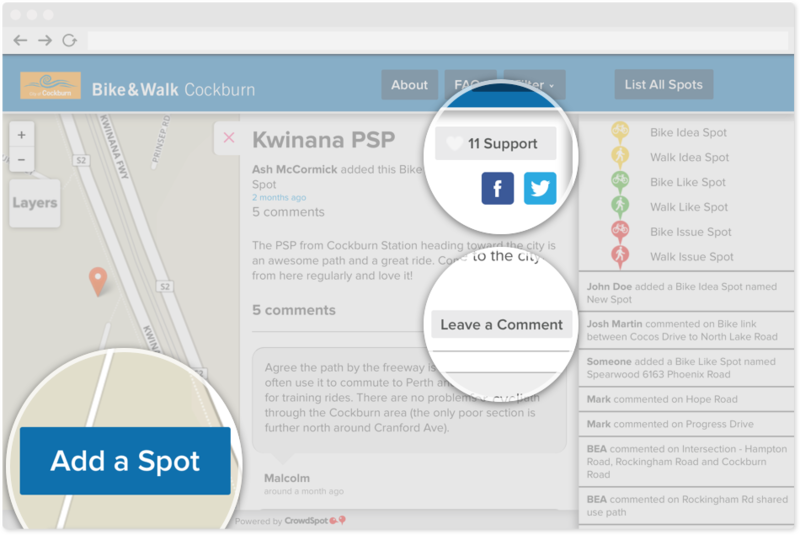 As part of the development of the City of Perth’s Integrated Transport Strategy this custom CrowdSpot map was created to enable citizens to share their ideas and concerns across all modes of transport. The results of this project will help inform where improvements will be made. 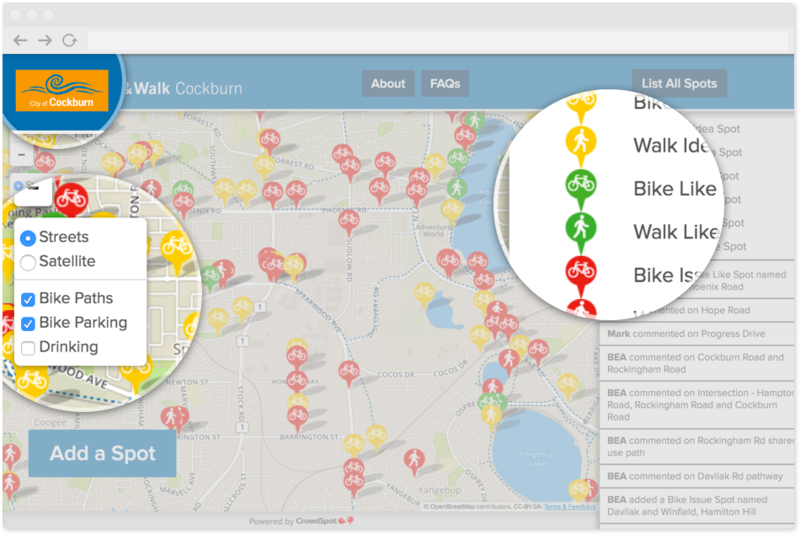 The City of Melbourne used CrowdSpot for the development of the Draft Bicycle Plan 2016-2020 to identify the top infrastructure priorities requiring improvement. Overall, there were over 5,000 combined submissions made on the map. View the dataset. We are here to help. Explore our site and contact us with any questions you might have. We're based in Melbourne and can setup projects for any location. CrowdSpot is an interactive, visual map-based tool carefully designed to generate greater levels participation, education and engagement. This unique combination of web map technology, community engagement and good design principles helps to deliver real insights for analysis communication and better decision making. Design the map base layer and overlays to enhance visual communication. Apply your own style project brand to the project. This feature helps to help shorten the length of the user’s survey path by only showing the relevant questions based on their response. Avoid having to enter in the same information more than once (if adding more than one spot) by making specific survey questions ‘sticky’ (pre-loaded based on previous response). In addition to adding their own Spots, participants can also comment or vote on other Spots and share Spot via Facebook or Twitter. The responsive web platform allows the functionality across all browsers and all devices. Easily embed your project map in your organisation website or use iPads during face-to-face workshops. Spots can also be viewed as a List. This also allows spots to be sorted by most recent, most ‘supports’ and most comments. There is also a keyword search, which is useful when looking for something specific. Real-time live activity so all the latest submissions are at your fingertips. Spatial visualisations are a great way to analyse data and communicate results back to the community. View web analytics and participation results in real-time. Our visual reports include a breakdown of all key quantitative data including the survey results and Google Analytics. We also include spatial visualisations within the report. Interactive archive maps are a great way to continuously view and visualise data. We strive to reduce barriers to citizen engagement so more people can participate in the planning process. This helps to build trust, collect quality information and make better decisions that reflect the priorities and views of the community. CrowdSpot was founded by urban planners and tech professionals interested in using technology to improve public participation and make better places. 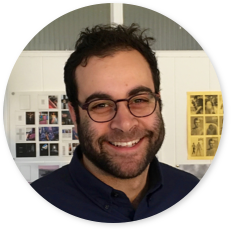 Anthony’s interdisciplinary experience is key for managing CrowdSpot’s operations and future vision. 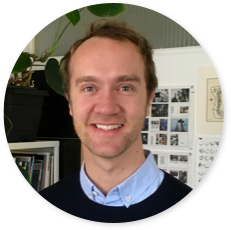 An urbanist with a passion for solving city challenges with technical solutions. 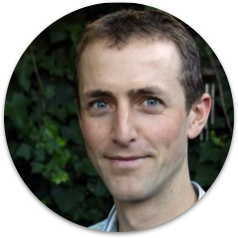 Anthony is a fellow of the Centre for Sustainability Leadership and is on the board of Engage 2 Act.